Ladbrokes.com and Casinobonus.net are currently offering a 100% bonus on your initial deposit at the casino, worth up to $500. To ensure that you receive your bonus, enter the Promotion Code CB500 when you register for a new account and make an initial deposit. 100% up to $500 deposit bonus! By using the Promotion Code CB500, you'll receive the best possible welcome bonus when you register for a new account with Ladbrokes.com, allowing you to play over 540 casino games with a bigger bankroll. You can use your bonus to learn new games, start up your online gaming experience and get used to casino and game rules as a beginner, or if you are a pro, you can use your new Promotion Code to try out a new casino, see if your new strategies work and fine tune them to rake in the winnings. Ladbrokes offers three varieties of casino software: downloadable, instant play and mobile. The downloadable software includes the largest variety of casino games, and is designed to run natively on your computer. The instant play software runs in your web browser, and will work regardless of the operating system you choose. The mobile casino software is designed to work with many of the most popular mobile phones. Ladbrokes.com has amassed a large player base, and offers customer support 24 hours a day, 7 days a week through phone and email. Because LadbrokesCasino.com offers so many different playing options, you will always find a game no matter where you're at. You can use your Promotion Code to play during breaks at work from any mobile device, or kick back after a long day with your PC or Mac and get in on a game. Use our Promotion Code CB500 to ensure that you receive the largest possible casino bonus. In order to unlock your entire bonus, you'll need to make a deposit of at least £5 and use those funds to purchase casino chips. Next, you'll need to satisfy the 20x playthrough requirement imposed by Ladbrokes casino by playing casino games for real money. Playing slots, keno and scratch cards will unlock the bonus at a 100% rate. Playing Cyberstud Poker will unlock the bonus at a 50% rate. Most other games, including video poker, blackjack, craps, baccarat, roulette, Sic Bo, Red Dog, 3 Card Poker and War will count towards the rollover requirement at a 10% rate. Low risk wagers, such as even/odd or red/black on roulette, will not count towards the bonus amount. You will have a total of 30 days to unlock the entirety of your bonus. If you attempt to withdraw money from your Ladbrokes account before rolling over the entire bonus, you will forfeit the bonus funds. 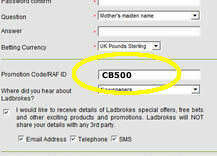 Make sure you understand the rules completely before joining the Ladbrokes Casino and applying your bonus code: CB500. After you read the rules thoroughly and understand them, get started and find out how much fun online gaming is, and how much money is waiting for you to win. The world of online gaming is full of winners. LadbrokesCasinos offer great payout percentages, the portion of your winnings you can withdraw. All online casinos take a percentage of every win, that's how they make their money, so you see, they WANT you to win, and they make it easier than ever to do it, even giving you lots of extra money to play with in order to do it. We rate the Ladbrokes bonus 4.1 out of 5. So get started today, and use your Ladbrokes Casino.com bonus code to play and win.